Incorporated in 1955, the Town of Hunts Point is located on the eastern shore of Lake Washington just north of the SR520 bridge. Once a camping ground for the Sammamish Indian tribe, this residential community of single-family residences is home to just under 500 residents. Hunts Point is one of the smallest municipalities in Western Washington, yet its bucolic feel and proximity to Seattle and the Eastside help make it a highly desirable place to live.Residents relish the sylvan nature of Hunts Point and the privacy that comes with living in an urban forest. They also enjoy unsurpassed access to Lake Washington and the activities and vistas that waterfront living offer. As a testimony to their excellent stewardship, Hunts Point has earned the designation of Tree City USA from the National Arbor Foundation since 1991. Hunts Point was named after Leigh S. J. Hunt, who owned the Seattle Post Intelligencer in the late 1800's. While Mr. Hunt never lived on Hunts Point, he once owned property at its very tip. If you want prestige and privacy, this is where you can find it. Home of some Titans of industry and major sports stars, you won't see much when you drive down Hunt's Point Road. Famously generous parcels and gentle slopes down to the lake shore help keep the mystery alive of who lives where. Estate grounds are the rule here. Less than 500 residents can call this hamlet home. What is surprising given it's size is The Town of Hunts Point shares a true gem with the Town of Yarrow Point -- the Wetherill Nature Preserve. 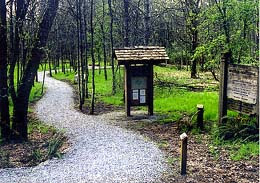 New visitors are amazed about the Preserve are its overall size (16 acres), the number of trails it encompasses, and the variety of birds and other animals who call its undeveloped acreage home. Trail walkers are treated to water front vistas with views of Cozy Cove that sparkle in the sun mixed with the forest of native trees and plants.